Brazil is going through a profound political crisis, probably more serious than the military coup in 1964, which ushered in 25 years of authoritarian rule. After his election as president in late October, the neo-fascist Jair Bolsonaro has been selecting his ministers. His most important decision – and one that will probably change the destiny of Brazil for many decades – has been to choose Paulo Guedes, a ‘Chicago Boy’ advocate of extreme free-market economics, as a super-minister, responsible for a hugely-expanded finance ministry. As Bryan Pitts, from Indiana University, has pointed out, Guedes is perhaps ‘the most grotesque proponent of neoliberal, market-friendly policies the US has ever had in Latin America’. According to Juliane Fruno, from the University of Campinas, São Paolo, ‘he is talking of raising a colossal two trillion reais (£400 billion) during his four-year government by selling off absolutely all the state companies’. Such a fire sale, largely to foreign corporations, would destroy Brazil’s already battered plans for becoming an independent world power. 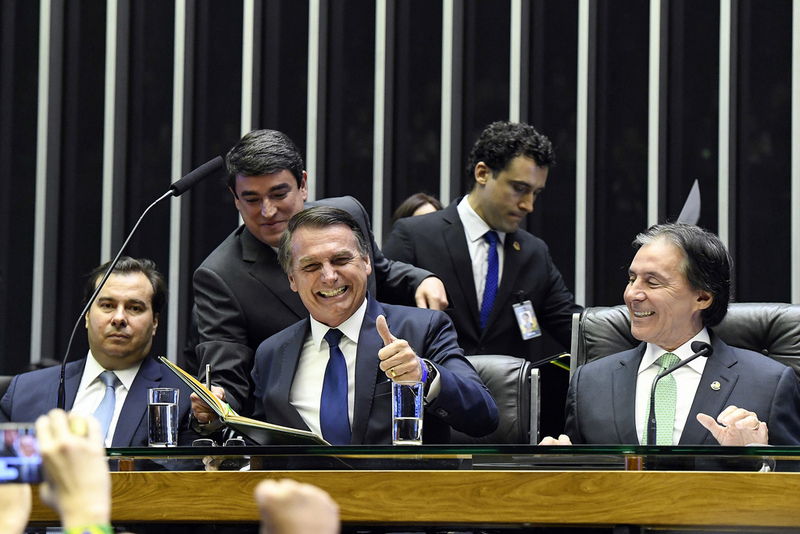 These policies, along with Bolsonaro’s equally alarming plans for slashing social welfare, dismantling environmental safeguards and ripping up gun controls, will be opposed fiercely by many sectors. What is remarkable is that opinion polls have repeatedly shown that Brazilians don’t support Bolsonaro’s most radical policies. For instance, three-quarters of the population is against the sale of the country’s huge state-controlled oil company, Petrobras, to a foreign company, as Guedes plans. There are rich pickings in Brazil for US corporations, which seem anxious to regain some of the space occupied by the Chinese while American attention has been elsewhere. US defence secretary James Mattis, the retired marine corps general who earned his ‘mad dog’ epithet during the Iraq war, recently said that ‘competition between great powers, not terrorism, is now the main focus of America’s national security’. And Brazil’s huge natural resources – one of the world’s largest hydrocarbon reserves, the planet’s greatest biodiversity, its abundant mineral reserves, its arable land – make it a very attractive prize for US corporations anxious to expand their reach. Until Bolsonaro’s victory, there was one problem – even pro-American Michel Temer, the lame-duck president seeing out his term, could not open up the country quickly or radically enough to satisfy the demands of neoliberalism. The solution was to facilitate the victory of a candidate who would. Although some of Bolsonaro’s inflammatory attacks on women, gays and indigenous people may be too extreme even for Donald Trump’s US administration, he was seen as a candidate who could win and Washington could ensure that he adopted US-friendly economic policies. Indeed, Bolsonaro selected Guedes as his economic guru shortly after a meeting in New York with the corporate think tank Americas Society/Council of the Americas (AS/COA). So the US started providing funds and know-how to assist Bolsonaro in his electoral campaign. As Marcelo Zero, a sociologist and advisor to the Workers’ Party (PT) in the senate, has said: ‘It is an old tactic, developed by the US and British intelligence to manipulate public opinion and influence political processes and elections. It was used in the Ukraine, the Arab Spring and Brazil in 2013.’ Hard evidence is beginning to emerge, thanks to diligent Brazilian journalists, of the way millions of dollars were brought in, mainly from the US, to fund fake news campaigns. Brazil is turning into a case study of Thomas Piketty’s assertion that capitalist accumulation in the 21st century is not compatible with democracy. Other analysts say that the anti-Bolsonaro campaign in the run-up to the second round of the election brought together forces that go far beyond the Workers’ Party and the traditional social movements. Many of those who took part admitted, like Eliane Brum (see opposite), that they were voting for Fernando Haddad, the PT candidate and Bolsonaro’s opponent in the second round, through gritted teeth. They couldn’t forgive the PT for its betrayals, but they needed to defend democracy.